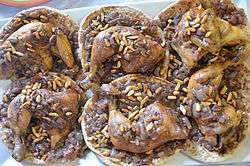 Musakhan (Arabic: مسخّن‎‎) is a Palestinian cuisine dish, composed of roasted chicken baked with onions, sumac, allspice, saffron, and fried pine nuts served over taboon bread. It is also known as muhammar (Arabic: محمر‎‎). It is often considered the national dish of Palestine. The dish is simple to make and the ingredients needed are easily obtainable, which may account for the dish's popularity. Many of the ingredients used — olive oil, sumac and pine nuts — are frequently found in Palestine cuisine. The dish is also popular in levant, particularly among Palestinians. Musakhan is a dish that one typically eats with one's hands. It is usually presented with the chicken on top of the bread, and could be served with soup. The term 'musakhan' literally means "something that is heated." On April 20, 2010, the largest ever dish of Musakhan was prepared in Ramallah, Palestine and entered it into the Guinness Book of World Records. Palestinian Prime Minister, Salam Fayad, described it as a great achievement and honor for the Palestinian people: "This great achievement completely depended on Palestinian products, mainly olive oil. It also has a cultural dimension and a Palestinian message to the world that they want their legitimate rights." The total diameter of the 'Musakhan' loaf was 4 meters, with a total weight of 1,350 kg. Forty Palestinian cooks made use of 250 kg of flour, 170 kg of olive oil, 500 kg of onions and 70 kg of almond. ↑ Trevor Mostyn (1983). Jordan: A Meed Practical Guide. Middle East Economic Digest Limited. ISBN 978-0-9505211-8-3. ↑ Ghillie Basan (January 2007). The Middle Eastern Kitchen. Hippocrene Books. pp. 189–. ISBN 978-0-7818-1190-3.